Save time and secure your place in advance for this afternoon tea experience at Dubai’s Burj Al Arab, including private return transport from your hotel. Be whisked to the sail-shaped hotel and settle into its fountain-decorated Sahn Eddar atrium lounge. 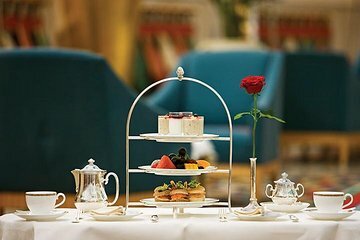 Then, savor a 7-course tea of scones, sandwiches, and pastries, served with a selection of teas and coffee as you soak in the views and exclusive atmosphere. Our Tea at Burj al Arab and the seven course meal were OUTSTANDING. They sent a driver for us and he was so professional as well. This was truly an experience we will remember and it was well worth the price. We highly recommend the TEA!!! !